SO, my first week on the Atkins diet went great. I dropped five pounds. Now I KNEW that I would not continue to lose at that rate, but I didn’t expect to stay STUCK at the same spot for the next two weeks! WTH is up with that??? I have been soooooooooooooooo good about ‘sticking with the program’ too. Resisted the temptation to have a big bowl of yummy creamy clam chowder last week when we went out to dinner and everyone else had a bowl. Even ordered my fish dinner WITHOUT rice pilaf. And I looooooooooooove rice pilaf. sigh. If I don’t lose at least a few more pounds by the end of this month, I give up! I’ll just have to learn to be a happy, CHUBBY little old lady! sigh. Christmas in July. Easter in August. Yep, I’ve started on some Christmas crafting already! 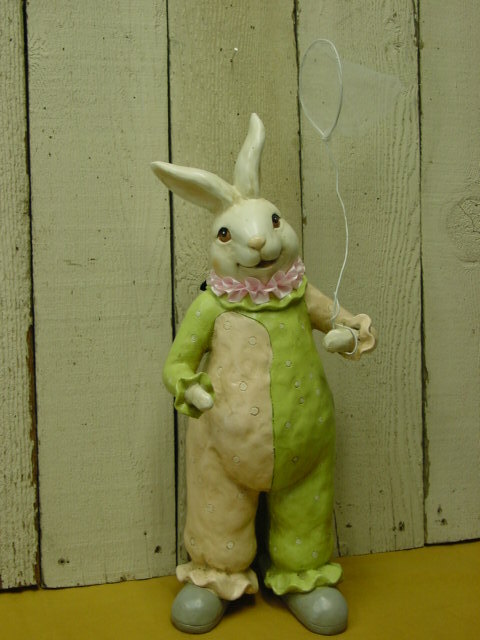 Not really WORKING on Easter right now, but I seem to be finding a lot of great Easter type stuff at really great prices. So, I’ve started a little Easter stash. This bunny is BIG! Nearly 2 feet tall. Will probably ditch the butterfly net he is holding and give him a basket to hold. Maybe a different collar, and some kind of hat??? Or glitter up the spots on his suit! 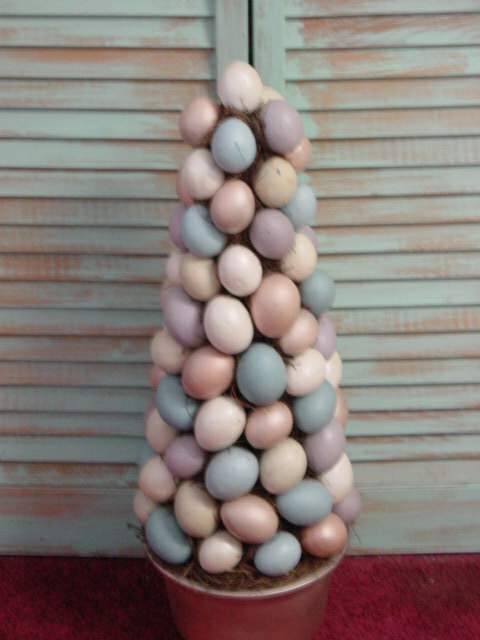 This egg tree is probably a tad taller than the bunny. I already had it packed away so I couldn’t get pics of them together. 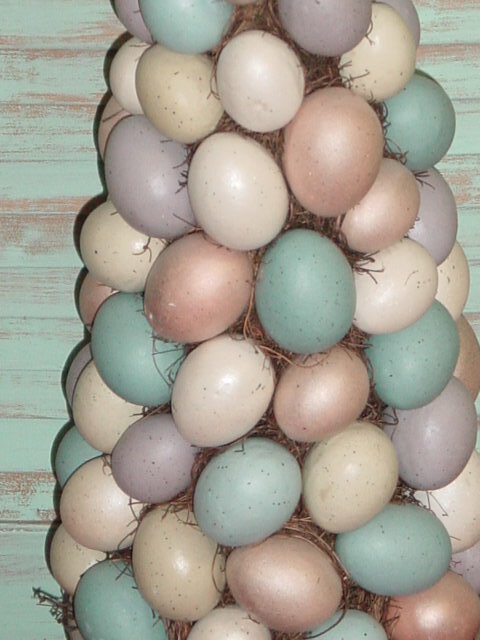 But they will make a GREAT statement in my booth when Easter time rolls around again. And by buying them now, off-season; AND on half price color tag week at Goodwill . . . I saved a LOT. Even by thrift store price standards! A few of the eggs had small dents in them, but I should be able to disguise all those with GLITTER. I’d love to glitter each specific color of the eggs. But that might be too daunting (and MESSY!!) to actually do. I may have to defer to CLEAR glitter all over the whole thing. Are YOU working on anything, besides your tan and trying to stay cool?!?! It’s normal to plateau when losing weight or exercising. Hang in there! It WILL happen! 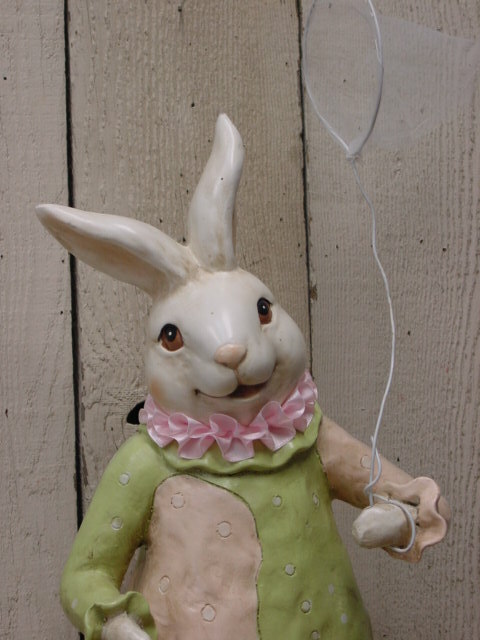 I think the bunny would look nice in more softer pastel tones. Maybe glitter spots on his dots would look nice, too. 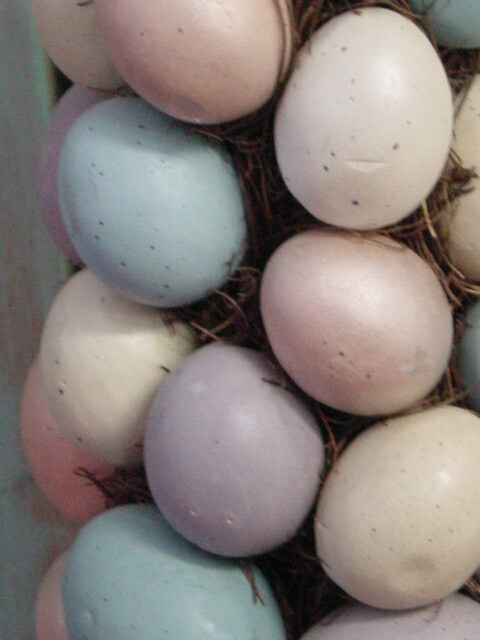 I reckon the eggs would look fantastic painted white and glittery! I’d buy it! I am trying to paint my craft items but it is sooooo danged cold and wet here in Victoria, Australia. NOT looking forward to the heat at all come summer, can’t get paint to not go gluggy then! Oh, how we complain each season! Nearly spring here , boing boing!